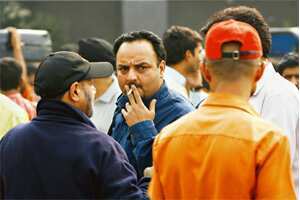 2 October: Smoking in public spaces is banned in India. This picture was shot after the ban and moments before the man was approached by anti-smoking enforcement officials in New Delhi. I was thinking the other day of a time—not so very long ago, say, in 1994—when being on a long-haul flight for me used to go like this. Settle down, reassuringly pat the cigarette pack in my pocket, open the book, wait for the seat belt sign to go off, clink open the tiny ashtray embedded in the narrow armrest and—oh, such bliss—light up. In no time, the drinks trolley, with its enticing array of miniatures, would come around. There I would be, in the sealed pod of the aircraft, reading, smoking, drinking, gaining in altitude. Could one, I used to ask myself, be any closer to heaven? 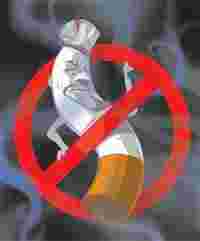 India, till very recently the last refuge of the unapologetic, unrepentant smoker, has become truly globalized this year. Like posh countries, it has banned smoking in public places. I could see the way things were shaping up whenever I travelled abroad. First, smoking at bar counters in the UK went out, but all the pubs still had loads of smoking tables. So all you needed to do was to not smoke while you were waiting for the head of your dark ale to subside. Then the smoking tables went, and we’d stand outside, freezing if it was winter, drawing the smoke into our lungs, feeling—to adapt the late British playwright Simon Gray’s line—the old friend and scoundrel swirling about in our lungs. We needed that sustenance, again and again, before returning to our cigarette-less drinks. Till a few years ago, as one waited to board the plane at the Charles de Gaulle airport in Paris, in front of the huge French windows so clean and gleaming that they seemed not to be there at all and one felt as though one was looking directly on to the tarmac, one would find a smokers’ alcove. I could stand at the bar there, with a café or a carafe of Beaujolais, and smoke and read as I watched the planes land in front of my nose. By this time, I couldn’t smoke on the plane any longer, sure, but this was close enough to heaven on earth. Or that’s how it seemed to me. All that has gone now. Even Europe, my favourite continent, stubborn celebrator of radical free will, has given in. What a pity. But in India? I’d never thought this would ever really happen. I’d never have thought that I’d be denied the pleasure of arriving at a bar and making myself comfortable at a table as I waited for the orders to turn up. Oh, the ritualistic thrill of setting out on the table the accompaniments of the evening ahead: cigarette pack, lighter/matchbox, neat and aligned, alongside each other; or, if the mood took me, one on top of the other, the matchbox smaller and in the dead centre of the larger pack of cigarettes. A lot of the pleasure of an experience is derived from the pleasure of its anticipation. And then, there was the thing with sharing a cigarette. The comradely thing, of course, when out with a man; and the thing that Evelyn Waugh in Brideshead Revisited described as the tiny bat of sexuality that squeaked when I shared it with a certain kind of person. So what does a poor wretch like me do nowadays? I try and look for bars that have adjoining open-air areas in which smoking and drinking simultaneously are allowed. There aren’t that many of them. Going out for a drink these days has become like being on a long-distance flight. Drink all you like, but have that pleasure destroyed by not being able to smoke at the same time. Solution? I go out much less. Invited to people’s homes, I look around for an ashtray with the sort of furtiveness one might feel if one were sizing up the host’s wife. And when hosts look at me with withering scorn, titter condescendingly and tell me how bad all this is for my health (the scorn I can take, I am often scornful of myself; the infantilisation I can’t), I slink out, upbraided but unbowed, to reduce my life span by 8 minutes. But it’s hard work, I tell you, all this social service. For what else is it, trying to save you from my secondary smoke? Because however much you tax tobacco, we shall keep on smoking. The more we remain resolute, the richer you get. And then on to health care, as we spend to keep ourselves alive so that we can smoke some more. We shall puff up your coffers. We are useful, you see. Not that you give us any credit for that. I find that I need more and more succour in these dark times. That’s another way in which things have changed. So I keep handy a few books: Richard Klein’s Cigarettes are Sublime; an anthology, Smoke: A Global History; Simon Gray’s memoirs, The Smoking Diaries and The Year of the Jouncer. It helps because I know things will get only worse. Next year will see cigarette packs with large pictures of rotting teeth, ruined lungs, perforated mouths: the results of a lifetime of stubborn recklessness. I assume they will be—just in case we’ve been unable to grasp the import of the visual—accompanied by unambiguous written messages about what might happen if we smoke. Certain countries have been doing this sort of thing for years. Me? I’ll switch to what I do when I am in those countries. I shall look for packs that say, “Smoking when pregnant can harm your baby". Good. We can agree on that. It’s something that will never happen to me. Soumya Bhattacharya is the resident editor of Hindustan Times, Mumbai.